This week’s Friday photo is of a building that most people certainly pass every day if they happen to work in the city centre. Formerly the Midland Bank, and located on Bennetts Hill, it is now a popular, bustling and busy bar, called the Cosy Club. From the outside, it’s evident to see that this building is steeped in history, with its beautiful façade delicately lined with ornate pillars, stretching and standing tall. 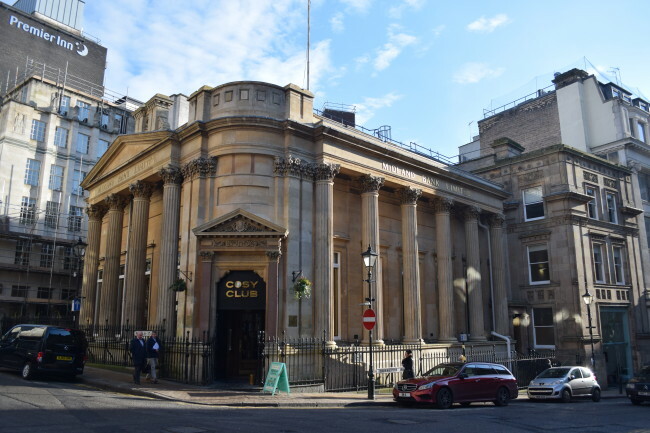 The grade-II listed building dates from 1835, designed by Thomas Rickman, and was the original home of the Midland Bank. Although no longer used as a bank, the building’s heritage can still be clearly seen by all who pass it, as gold letters adorn the outside reading ‘Midland Bank Limited’. Our city is full of wonderful snippets of history, you just have to look up occasionally to see it!